Departing Myrtle Beach and continuing south, we started this week with a stop in colorful Charleston on our way to Savannah. The dreamy moss-covered oak tree scenery continued into the sunshine state, where we stopped to visit family, got a live-action dose of Harry Potter, and went to see a movie star in rehab. SPOILER ALERT: It was a dolphin! One year. One couple. One small car… Fifty states. We may have crossed several state borders, multiple times, but we spent most of our time in West Virginia and Kentucky this week. Starry skies, friendly goats, and lakeside camping made this week memorably awesome! I can’t even express what a good time we had riding the Maid of the Mist around Niagara Falls! Who knew you could have so much fun being soaking wet? Niagara Falls has been on my Must See list forever, so when we left the Adirondacks, we headed west to experience the cool mist on a hot day. It was perfect. And after that it was back to the East Coast to finish off the week in our nation’s capital. Ahhh, the Adirondacks. These two weeks were probably the most peaceful of our whole 50-state trip. Completely unplanned — as are most of our favorite trip highlights — we enjoyed a two-week stay in a private cabin at Adirondack Woodcraft Camps. We’d received the invitation from a new friend we met in Acadia National Park the previous week, and I’m glad we took him up on the offer! Read on for the serene lake settings and wooded wanderings from our stay in the Adirondacks this summer, plus snapshots from our journey there. U.S. Road Trip Re-Cap: Week Fourteen (Hershey to New York City) — HALFWAY TO 50 STATES! At week fourteen, we officially reached the halfway mark of our 50-state quest. We departed Pittsburgh and set out for New York City, with a one-day stop in Hershey, Pennsylvania in between. Being my first time in NYC, we played the tourist game and saw all the popular sites — most of which were easy to see for free! Read on to find out more about our week in The Big Apple, plus our “sweet” stop in the Chocolate Capital of the U.S.
After our much needed road trip break in Chicago, we set our sights on exploring the Northeast. Indiana, Michigan, Ohio, and Pennsylvania were all checked off this week of our road trip, as we made our way to New England. And we saw a good amount of ultra-green midwestern farmland along our route. 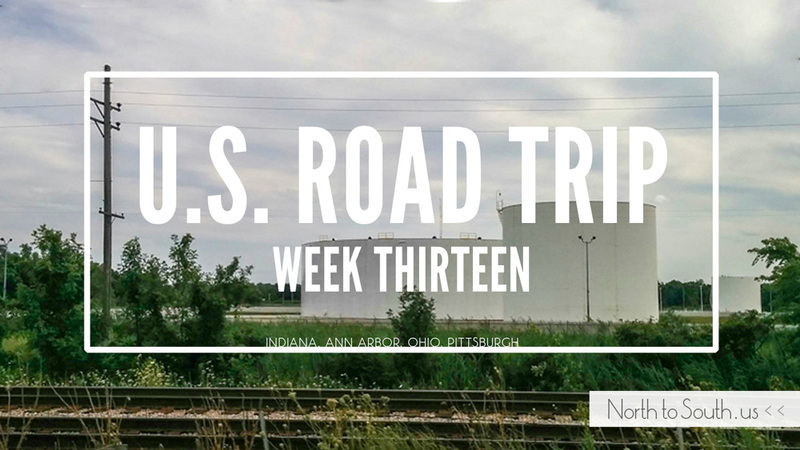 Take a look at our journey from Chicago to Pittsburgh on week thirteen of our trip!